Outstanding Design: The shower stool has anti-slip rubber feet, drainage holes on the bath seat, non-slip dual handle design, convenient for elderly, disabled, Bariatric, pregnant or patient. Height Adjustable: The considerate bath stool comes with adjustable height with large rubber tips for added grip which can meet different groups of different needs in different situation, providing security guarantee while enjoying taking a shower. 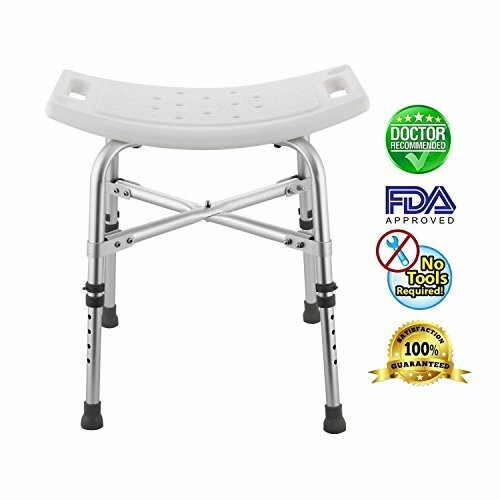 Lightweight And Exceptionally Stable Shower Seats: Comfort and Safety with the Adjustable Height Handicap Shower Seat Bath Stool for Elderly, Heavy Duty, strong. Fits Even In Small Tubs And Showers: The ample anti-slip platform and wide base give this bath chair stool maximum stability while the non-slip rubber feet ensure the shower bench seat . Widely Usage: Ideal for the elderly, seniors, adults, disabled, pregnant women or those who have trouble bending, stretching, have arthritis, recent knee or hip surgery, or are rehabilitating.